1269 - 1282 A Franciscan Friary is constructed in Priory Park. Believed to have been the chancel of the friary, it contained the high alter and would only have been used by the resident Greyfriars who remained in Priory Park for more than two centuries until the dissolution of monasteries in the 16th Century. 1538 The friary was closed under the reign of King Henry VIII. 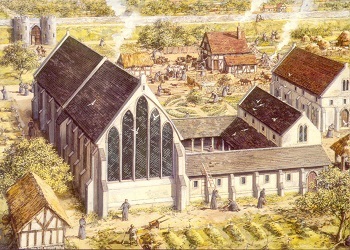 With the exception of the chancel, all buildings belonging to the friary were demolished. The site was given to the Mayor of Chichester. 1541 The City Corporation buys the chancel from the Mayor of Chichester. The building is used as law courts and the Town Hall, or Guildhall. During this time some famous trials were held here including the trial of the Hawkhurst gang of smugglers in 1749 and the trial of the poet & artist William Blake in 1804. 1850 The building stops being used as a Guildhall and is used by the Sussex Rifle Volunteers as an Armoury and Drill Hall. 1947 The Guildhall becomes Chichester's first museum site and is used to display historic artefacts for the people of Chichester. 2007 - 2009 The Guildhall undergoes a major repairs programme and becomes a hire venue for community events. 2015 The Guildhall is granted a license to host civil ceremonies and becomes a wedding venue for the first time in its history. Soon after the Norman Conquest Earl Roger de Montgomery ordered the construction of a motte-and-bailey castle. It was built in the north-east corner of the city, partly enclosed by the city wall and probably required the destruction of several properties already there. The remains of the raised mound (motte) are still visible today in Priory Park. The keep was probably made of timber, as there is no reference to it being made of stone, and no evidence has been found. In 1192, when King Richard was captured in Austria, we know that the castle was stored with barley, beans and bacon. This was probably in anticipation of a siege by the forces of Prince John, the King's brother. In 1216 the castle briefly surrendered to the French, but the following Spring it was recaptured and demolished it to its foundations on the orders of King Henry III. As some time between 1222 and 1269 the site of the castle was given by Richard, brother of King Henry, to the Franciscan Friars to build a new friary. The Franciscans arrived in England in 1225, and probably came to Chichester within a few years. The man who brought the order to England, William de Colville, had family connections in the city and may have suggested it as a suitable site. Their first friary was in St Martin's, but in 1269 it moved to the site of the old castle in Priory Park. Building work advanced quickly, as it was ready to hold an ordination ceremony in 1282. Little is known about the exact layout of the church, but altars to St Katherine, Our Lady and St Francis were referred to in wills from the 15th and 16th centuries. The only rooms mentioned in an early inventory were a guest house, parlour, library, refectory, brewhouse and the cloister. Only the choir of the church was mentioned, suggesting that no more was built. In October 1538, the monastery was dissolved by King Henry VIII, as it had an annual income of less than 200. In fact the house was 10 in debt and only seven brethren were resident. The site of the friary was given by the King to the Mayor and citizens of Chichester. In 1540 the King also sold them the friary church which became the Town Hall or Guildhall. When the choir of Greyfriars was given to the City in the 16th century, the rest of the friary was leased out. The first lessee was John Knott, who built a house adjoining the Choir. During the early part of the seventeenth century the house was occupied by the Caryll family and later became the headquarters of Sir William Waller during the Civil War siege of Chichester. The poet and painter William Blake moved to Felpham, to the east of Chichester in 1800, and it is claimed the words "And did those feet in ancient time, walk upon England's mountains green," were written about The Trundle at Goodwood. In January 1804 he was tried for sedition after being alleged to have uttered treasonable words in the Fox Inn at Felpham. The case, like others at this time, was heard in front of the county court of Quarter Sessions, held at the Guildhall in Priory Park. (Court sessions often started at the Guildhall but were adjourned after the first few cases to the Swan Inn in East Street which was much more comfortable). Blake was supported at his trial by poet William Hayley and local printer Joseph Seagrave. The charges were dismissed. After the trial, Blake and his wife moved back to London.